Jinbei (ジンベイ, Jinbei) is an enigmatic character who's a Shikigami and a familiar of the Senri Shrine. Little is known about them, but they have served at the shrine for generations. Their name is Jinbei (ジンベイ), which apparently is not their real name. 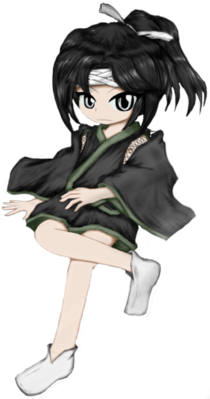 In JynX's illustration, Jinbei looks like a little child with long black hair, which is tied back in a ponytail, and their forehead appears to be wrapped in bandages. They wear a short single-layer black-and-green jinbei-haori (甚兵衛羽織) with detached sleeves, however it is described as sleeveless in Brilliant Pagoda or Haze Castle. Jinbei's name is a nickname given because they wear the jinbei-haori year-round. In Japan, jinbei are traditional Japanese clothes worn during the summer as either sleepwear or house-wear, and is sometimes used as a substitute for a yukata by mostly men or boys, but can also be worn by girls as well. On 26 January 2017, JynX created a poll on Twitter, allowing fans to vote on four options revealing some information about the Len'en Project, with the third option being that Jinbei's design would be revealed. This option was chosen, and on 3 February, JynX began designing Jinbei. The final design was posted on 10 March. After Tsurubami Senri chooses Yabusame Houlen and Tsubakura Enraku as their temporal successors, Jinbei is shown to be monitoring them and giving them missions. In the prologue, they were about to tell Yabusame and Tsubakura about the weather incident caused by Adagumo no Yaorochi, but Tsubakura pranks them with horrible coffee. After the prank, Jinbei finally tasks them to stop the weather. Sensing that something is wrong and that a terrible incident is coming, a horrified Jinbei wakes the heroes up and tasks them to stop the spirits that are wandering around Mugenri. In Yabusame and Tsubakura's ending, they are angry at the heroes for bringing Shion, the incident's culprit, into the household. They are very wary about Shion's true intentions, but they let them stay in the Senri Shrine. Yabusame Houlen and Tsubakura Enraku are employees of the Senri Shrine. Like everyone else, Jinbei considers Yabusame to be an idiot, but thinks they're cute nonetheless. Tsubakura seems to respect Jinbei a lot and calls them "sensei", but still pulls pranks on them. Jinbei particularly dislikes Tsubakura and considers them to be creepy. Tsurubami Senri is Jinbei's master. In the full illustration, a green book can be seen titled "Irish Fairy and Folk Tales". This page was last edited on 13 November 2018, at 09:50.